Video Game Controller ?! Nope! A Power Wheelchair Joystick Control! Drive Station power wheelchair control with custom fabricated seating….stay tuned! I have not trialed this product with any war veterans, however, I have recently trialed this product with a client with Muscular Dystrophy with Motion Specialties. What’s quite nice about this drive system is that it can be placed at midline and the client can use either their left or right hand to drive. This is a great option for clients who may fatigue quickly with one hand as they can easily switch to their other hand if needed. Also, if using the proportional joysticks becomes too difficult, the buttons on the Drive Station also can be used to drive the wheelchair. Some things to consider with this product, however, are that the proportional joysticks do have a bit more resistance than the go-to HMC Mini Joy. In addition, if the Drive Station is not mounted on a fixed mount, it could slide out of reach for some clients or be set-up in the wrong position for optimal access. I am currently still working on a custom seating system with Ability Health Care for this client. Once seating system and the custom mounting of this control is completed, I will definitely share the pictures with you so stay tuned! Happy Wednesday Everyone! I wanted to share with you a custom fabricated Thoraco Lumbar Sacral Orthosis (TLSO) that was fabricated by Alan Keith Valley Orthocare in Surrey, BC. This back brace was made for a client with C5 complete spinal cord injury. This client had very limited trunk control and had been using a custom fabricated ABS backrest for a while with a chest strap, however, due to the flexibility of her spine, these components still did not provide adequate control and support. This made it difficult for the client to establish appropriate sitting balance for functional activities, it made it difficult to manually self propel in a manual wheelchair and also resulted in constant and severe nerve pain. This TLSO was fabricated by casting the client’s trunk in the desired position. Alan Keith, Orthotist, then fabricated the brace from the contours taken from the cast. Several follow-up appointments were made to adjust and tweek the brace. For example, the bottom of the TLSO was trimmed back to allow the client to lean forwards for transfers and for off loading for pressure relief. The top of the brace was flared for added comfort. Sheepskin pads was added as the client was developing redness at the back of the pelvis over her PSIS. In addition, foam pads were added to allow for additional clearance of the spinous processes, which were also prone to pressure if the brace moved slightly out of place. See the photos below. Overall, the client using the brace has reported improvements with regards to nerve pain, sitting balance, ability to self-propel and function. It is important to note that if a TLSO is suitable for a client, the wheelchair seating must be adjusted to accommodate the brace. Also, it is important to note that a TLSO only really provides support and control for the trunk. What I found was that although the TLSO worked beautifully for this client, we ended up lacking support and control at the pelvis, which was resulting in the client falling into posterior pelvic tilt and falling into obliquity (right side higher). I will now be exploring custom cushion options with this client and will likely be trialing a Ride Custom cushion as this will likely be the best way to maintain her pelvic positioning while also preventing the risk for skin breakdown. Hello Everyone! 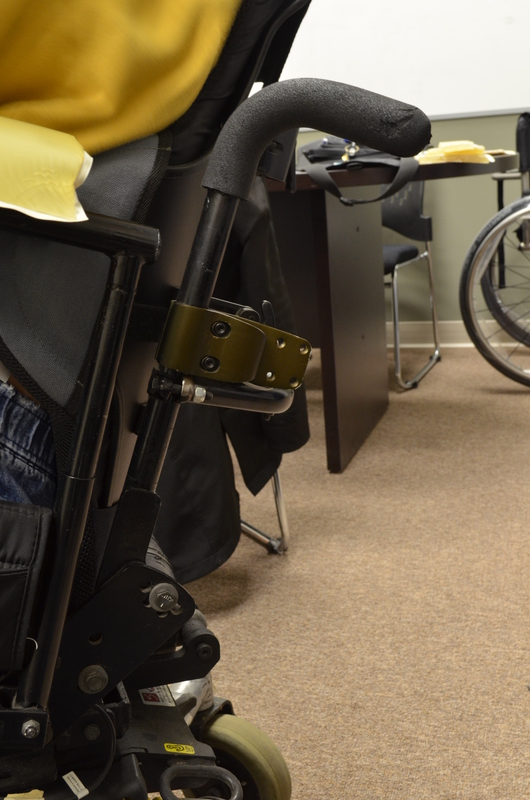 Here is a video on common postural terms used in wheelchair seating assessment. Although some of you may use variations of these terms, hopefully this video still helps as a quick reference! Please feel free to send me any feedback on these videos or even requests for other video topics. I would be happy to try put something together if it can be helpful to anyone out there. Thanks again to my talented friends, Desy Cheng, Kyle Hay and Jeremy Jude Lee at Vanmedia. Thanks for checking in today! Seating is Super!